Do you have leftover cranberry sauce from Thanksgiving still? I totally do, I made ten jars of it! I over do it to avoid running out, that would be horrible! Plus the first week December seems to be daunting for most really. If we haven’t already made our baking lists, we sat down this week to realize there is so much to be done! I have re-written my shopping list so many freaking times, it’s nuts! I think I have it down finally, but we’ll see next week when I remember that I forgot to make something lol! So I tend to over do it, cranberry sauce included, and I fond ways to incorporate it so I don’t waste it obviously. 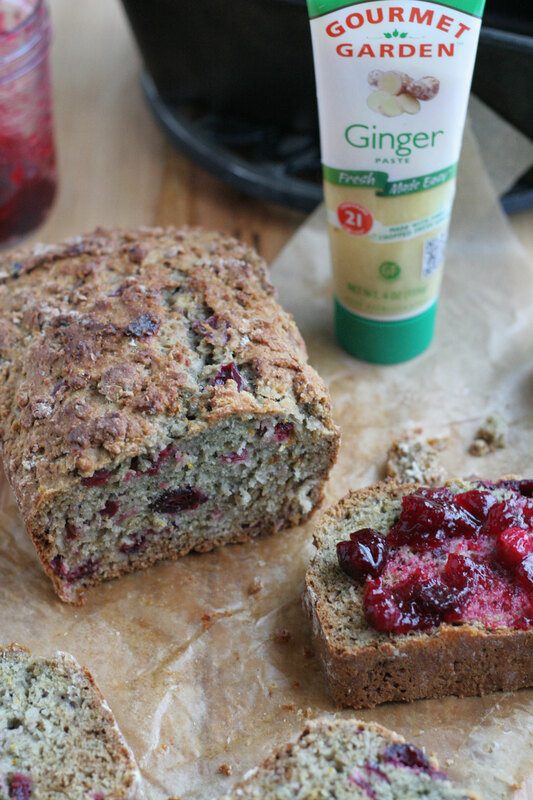 This year I made cranberry sauce bread, and added my favorite easy to use ginger from Gourmet Garden. I made the cranberry sauce, but you could easily use the jars that you bought for Thanksgiving, or will have for Christmas. Either way, we all have cranberry sauce we need to use up right? It’s also kind of an interesting time of year for us. Normally, just like for Thanksgiving, we host both of our families at our house. We have Christmas and New Years together, but this year it’s a bit different. Our families have a lot going on, and they aren’t coming to visit, so that is totally weird. My Mama, and one brother live here, and my Dad is visiting, so we will do a small gathering, still with great food of course! And we are doing a short trip to Idaho to celebrate with Brian’s family, and then back here to be with my family. It will be different fun, although I will miss seeing my oldest brother, his wife, and my niece this holiday. I am still sending her epic gifts! So my meal planning and baking, apart from blog recipes, is side ways for me. I am so used to coming up with larger meal planning for breakfast, lunch, and dinner for a couple of weeks at the end of the year for us all to enjoy while we relax. But because we have no visitors and we are going out of town for Christmas Day, I am changing things up. Even though it’s a smaller gathering, there will always be leftovers in our household, that’s just how I roll. Make more, cook less. 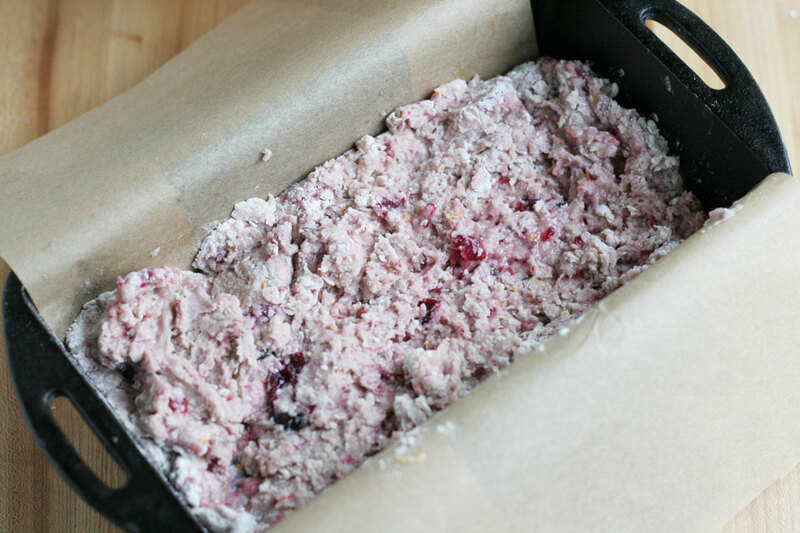 Baking a quick loaf of bread for breakfast is one of those nice treats to have for the holidays along side all of the savory dishes, oh and cookies. I used Gourmet Garden herbs to make this savory and sweet recipes. You know me by now, I always keep a stash of their herbs in my freezer for last minute dishes like this. They are organic, high quality, easy to use kitchen happy herbs. 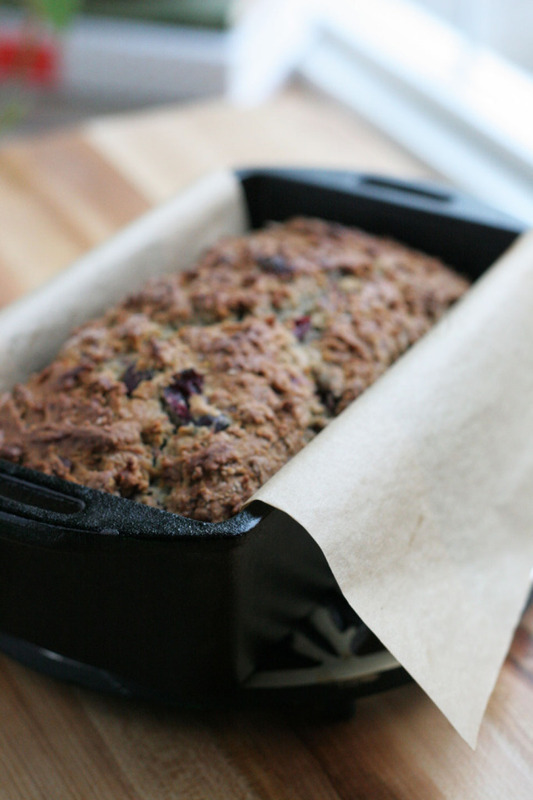 Line a bread loaf pan with parchment paper, or coat with grapeseed oil. 1. 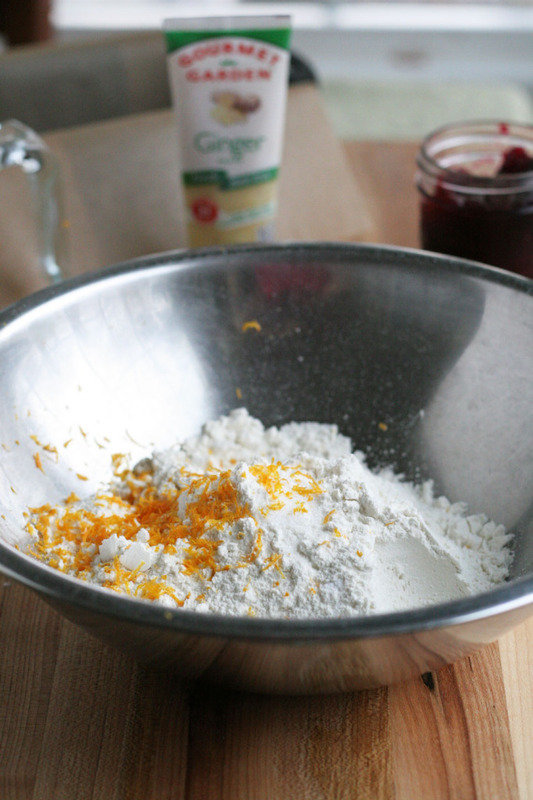 In a medium bowl combine flour, baking soda, salt, and orange zest, whisk to combine. In a medium bowl combine grapeseed oil, cranberry sauce, honey, ginger, and eggs, using a fork, whisk to combine. Add the oil mixture to the flour mixture, use a spatula, and gently combine. Do not over mix, just mix until the flour is mostly incorporated. Add to pan, and place in oven for 55-60 minutes. 2. Remove pan from oven, and allow to cool 15 minutes before removing loaf from pan. Place loaf on a wire rack and allow to cool another 15 minutes before slicing. 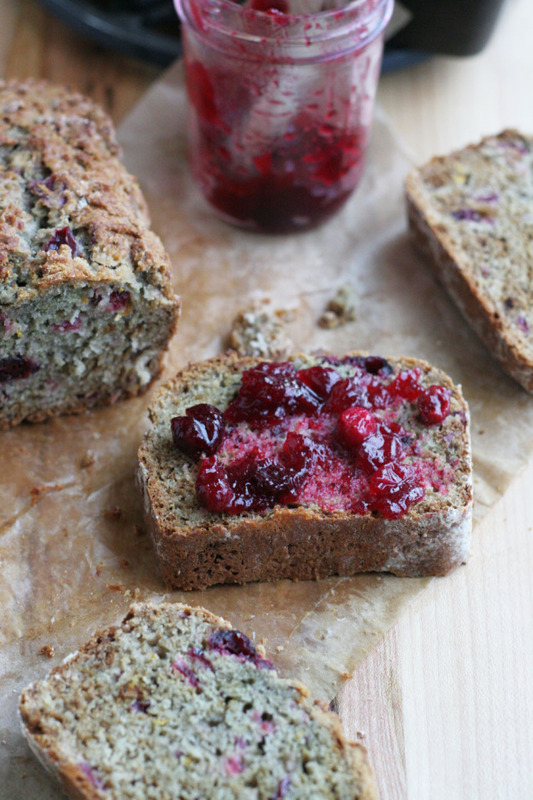 Serve with butter, and or more cranberry jam! Store in an airtight container for up to 3 days. I’m always looking for new quick bread recipes – I love the flavors in this one!! Thank you! I love a good quick bread as well. Omg! This looks fantastic. I wish I hadn’t tossed out the extra from Thanksgiving! OMG..is this real life. This bread is genius! I would have never thought to add cranberry sauce to bread! Hahahaha! Thank you so much!!! Everything about this looks delicious!! I use Gourmet Gardens, too, and I find it saves me lots of time and hassle! Love the look of that bread. I agree! I love fresh herbs, of course. But I find myself grabbing the GG for so many recipes, it is so easy and so good. I remember our conversation at Big Potlcuk, and it seems I use it way more than I thought I would. Thank you, Liz! Oh I love having the herbs in my freezer.